Lydia is a Nord warrior living in Whiterun. She is likely to be your first housecarl, which she becomes after you are titled a thane of Whiterun upon completion of the Dragon Rising quest. If she is not following you, she resides in the main hall of Dragonsreach, although if you purchase Breezehome, she will move there. Lydia wears steel armor, with steel Nordic gauntlets and steel cuffed boots. She wields a steel sword and shield, and is also equipped with a hunting bow as a follower. With the addition of Dragonborn, Lydia becomes much more expressive than she was previously, with new unique dialogue. Although Lydia is in the PotentialMarriageFaction, she must be added to that faction manually with a console command addfac 19809 1 in order to enable the marriage dialogue. When in Breezehome, she sometimes gets stuck in a loop of sitting down in the chair in the bedroom and then standing up. You can break this loop by sitting in the chair yourself when she gets up, or asking her to follow you when she stands up. When dismissed after completing the Civil War quest Battle for Whiterun for the Stormcloaks, Lydia will not appear at Dragonsreach again. ? To avoid this, speak to the new Jarl about becoming a thane before visiting your house for the first time after the quest. Since you have already met the qualifications, he will restore your Thane of Whiterun title. Return to your house and you should find Lydia there as if nothing had happened. However this is not needed if you have married her and have moved her out of Whiterun to a different home. 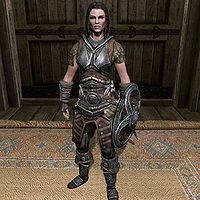 If Lydia is recruited by the Blades, she may reappear in Whiterun (wearing Blades armor) during the Battle for Whiterun Imperial quest. She then returns to her residence from before she was recruited to the Blades. ? If she is your follower and wife and you relocate your house, dismissing her while in Breezehome often results in her script not completing. She will just stand there not mentioning returning home. As long as her script is in this hung state it will affect your character's ability to take on or fully interact with other followers. ? This can be resolved by asking her to follow you again, leading her outside of Breezehome, then dismissing her. If you enter a trespassing room while Lydia is your follower, and somebody sees you the moment you enter (e.g. The Black-Briar manor at night, Sibbi can occasionally see you), then leave again from where you entered, Lydia does not follow you back out. To fix this, wait until it is legal to enter the house, then re-enter and leave again. Lydia should then follow you. ? With Dawnguard installed, if Lydia is told to "part ways" somewhere, she might not return to Breezehome, rather she will stand at that position. Lydia may vanish during a quest where you must leave her behind if you do not manually tell her to wait. This happens specifically during quests where you are assigned a partner who automatically replaces your follower. Lydia also appears in the Heroes of Skyrim card expansion for Legends. This page was last modified on 9 April 2019, at 05:05.